The consumer watchdog hopes new figures on the recalled Takata airbags will put manufacturers on notice to replace “ticking time bombs” as quickly as possible. Between those two states nearly 10,000 of the affected cars have the ‘alpha’ airbag, which ACCC chairwoman Delia Rickard said should not be on the road. “I think they are ticking time bombs, which is why we have been unequivocal in our advice,” Ms Rickard told AM. “If you have one of these cars don’t drive it … there’s a one in two chance that if there is a collision those bags could explode [and] spray metal shrapnel all over the car,” she said. “That includes letters, telephone calls and even to the extent of private investigators knocking on people’s doors trying to get them into dealerships,” he said. Ms Rickard said she was “quite pleased” with the way things were tracking and was hopeful releasing the figures on a quarterly basis would ensure manufacturers were held to account. “One of the things we are doing by making the replacement rates publicly available, it creates the incentive on all manufacturers to make sure they are putting their all into it,” she said. Mr Weber said it was a “good thing” if the data brought more attention to the recall, but he was worried some people would misinterpret it. 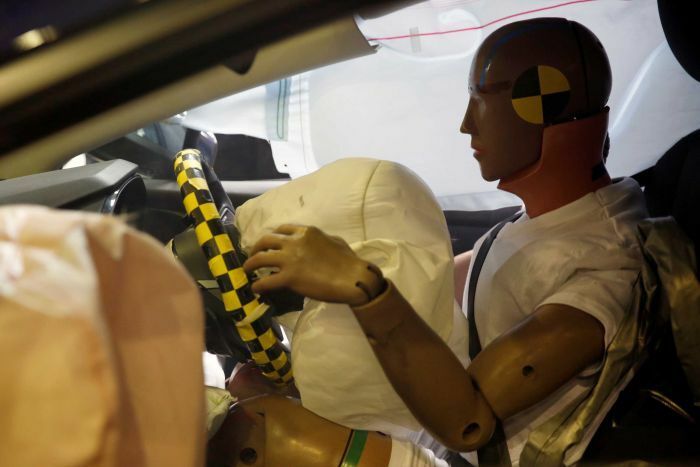 “I think the difficulty with these tables is actually understanding what it means, many of the airbags that are now being recalled in Australia have come into the list in the last six months, so it can easily be misunderstood,” he told AM. “The general public should only be concerned about their own vehicle and the vehicle of their family and friends, and they should go and investigate the status of their vehicles,” he said. “I do think there has been a sense of complacency… when you get that recall notice act on it the day you receive it,” she said. “The other issue we can look at into the future, if these cars don’t come in, is talking to the states about not registering the vehicles in the future. That is an open discussion at the moment,” he said.